Our spiffy new website went live four weeks ago, and now that we’ve lived with it for a while, we thought it was time for a formal introduction. The redesign is meant to make it easier to search, see, and listen to our archive of more than 180 stories dating back to 1991. It also works pretty well on phones, tablets, phablets, tablones, and other mobile devices, real or imagined. And it doesn’t look quite so 2004 as our old site. While our friends tell us the style is clean and sleek, there’s a lot going on under the hood. The biggest thing is probably the custom search function, with all sorts of “advanced tags” to let you specify topics, geographical regions, producers, and so on. The “Who We Are” section makes it easier to check out our bios and admire our mugs, the “Work With Us” section is an open invitation to colleagues and would-be colleagues, and the “Support” section makes the case for why you should be donating to Homelands RIGHT NOW. 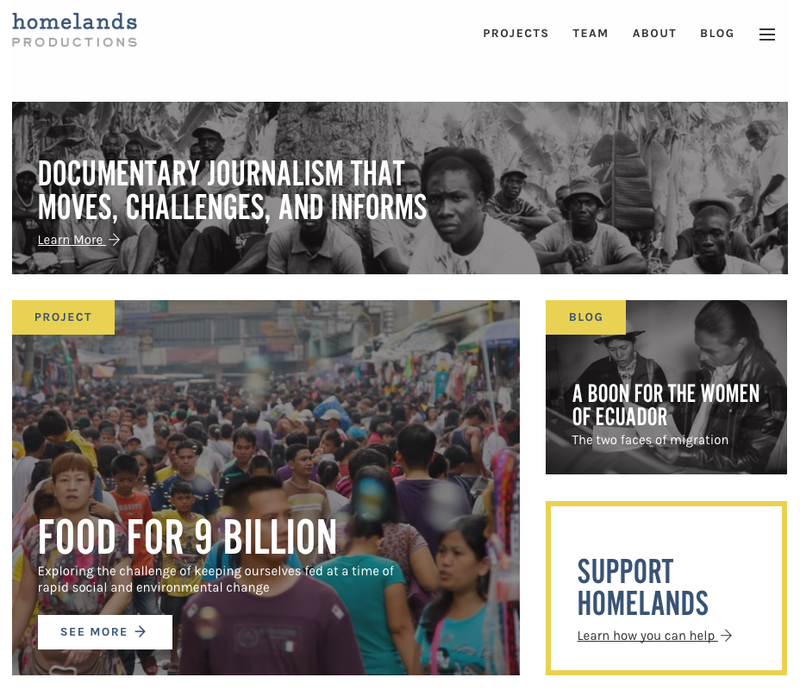 Homelands.org was designed by Lael Tyler and developed by Alex Hall. Curiously, neither has a website or a social media presence, although they assure us they’re legit. They do have email addresses; you can reach Lael here and Alex here. We heartily recommend them both.